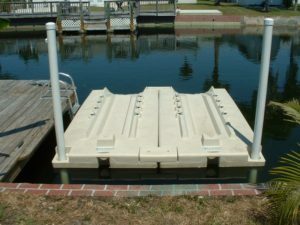 Jet-Port products protect your jet ski from environmental damage. If your watercraft is permanently in the water, moisture can seep in and damage important electrical and motor components. The wind and tide can also easily damage your ride by rocking it against your dock or wall. All of this creates unnecessary wear-and-tear that ages your ride faster than it should. Our docking platforms remove all that risk. You can be confident your watercraft is safely isolated from the environments. It is also extremely convenient. You can effortlessly take your jet ski in and out of the water. – PROTECTION FROM THE ELEMENTS: Keep your watercraft out of the water and waves to maximize its lifespan and prevent costly mechanical and electrical problems. – NO MAINTENANCE: Our Jet-Port prefabricated docks are extremely durable. Once they are set up, you can use them for years without worrying about anything going wrong. – CONVENIENCE: Effortlessly raise your jet ski in and out of the water in less than a minute.